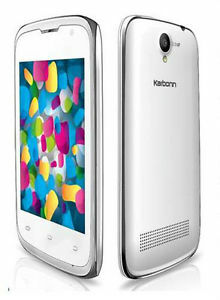 Karbonn A55 Smart is the latest budget dual core smartphone from Karbonn with entry level specs. The Smart A55 is priced at RS 3,790 and is available for purchase from online retailer EBAY. It has dual SIM support and runs on Android 4.2 OS. It gains the strength from 1.2Ghz dual core CPU integrated with 512MB of RAM. It lacks the 3G connectivity. It has 8.9 cm IPS capactive touch screen display and packs with 3-megapixel primary shooter. It is powered by 1100 m Ah battery and has 4GB of internal storage. other features are 2G, Edge, WiFi, Bluetooth , G-sensor and A-GPS. The Karbonn Smart A55 has a front facing camera as well, the resolution is not known yet. The Karbonn A55 would be launched within few days, but you can grab it now from ebay.in. The handset offers nice features at such price tag but the lack of 3G network support would make you despondent.